What happens when you get six friends together and head to Vienna for a long weekend? A lot of fun and a little bit of shenanigans, that's what. While we toured a little and stopped into some shops, we managed to fit in a few pub crawls and meet many people along the way! I went once in January with a friend but it was snowing and we froze our asses off the entire weekend. We still had a blast, but it was very very cold and with the icy snow fall it was difficult to really take in the city. Most days I wore a pair of long underwear under my jeans, leg warmers, warm socks, boots, two jackets, and a hat and was still shaking in the cold. We were still able to do a lot, including a tour of the opera, the church and a crypt tour inside (which I recommend if you happen to be in Vienna), a 5 hour visit to the oldest zoo in the world, the Schönbrunn palace, and more. So this time around I hoped to see and do other things. Well, we ended up doing many of the same things since I tend to take the role of tour guide, but I made sure we added a few more too so it didn't feel so much like Groundhog's Day (and when you do get to go to Vienna twice?!). Click here to see what a trip to Vienna in the winter looks like. I have been to plenty open air outdoor markets, but I see why this one is so popular. From asian cuisine to fresh seafood and cuts of meat, there were plenty of things to tantalize the senses. Yes, tantalize. And it was HUGE! I definitely recommend making a stop here to check everything out. Oh and don't forget to bring a bag or backpack with you to grab all the goodies you'll find. We did the 'famous' Viennese Pub Crawl! Say what?! It was here that we were connected with many young 20 somethings. Last year my husband and I did a pub crawl in Galway, Ireland, which was AMAZING, but we quickly found out we were the oldest people at the pub crawl. With the exception of a German couple, this was true on this one as well. I'm here to tell the world and anyone over 25 that pub crawls are fun at all ages! No need to sip wine and be fancy all the time folks. This pub crawl wasn't exactly as famous as they made it out to be. In fact, they weren't even sure if they'd be doing it when we arrived at this 'Travel Shack', but luckily there were enough thirsty patrons to get the show on the road. Our pub guide took us first on the S-Bahn and with drinks in hand and our iPhone on blast, we had a dance party on the short train ride. We also met Justin Bieber's brother, or I presume it was him, because his looks were uncanny. The night ended with us eating pizza from a stand on the side of a road. Classy right?! This pizza was extra special because it had maize (corn) on it and it was terrible. Germans and Austrians love to put corn on everything. Everything I tell you! We really did have fun on the pub crawl. With six friends traveling we were bound to have a great time. We were staying in an area near the Naschmarkt (at a hostel called Wombats Hostels), and on the first night we were there one of the side streets was having an open air festival. We only stayed for dinner and then found ourselves in a pub nearby. The neighborhood was fun and outside of the main tourist drag, making it even better. During the summer months there are festivals all over the city, and finding one shouldn't be difficult. Unfortunately photography is not allowed once inside the catacombs, but you can take photos inside the church. 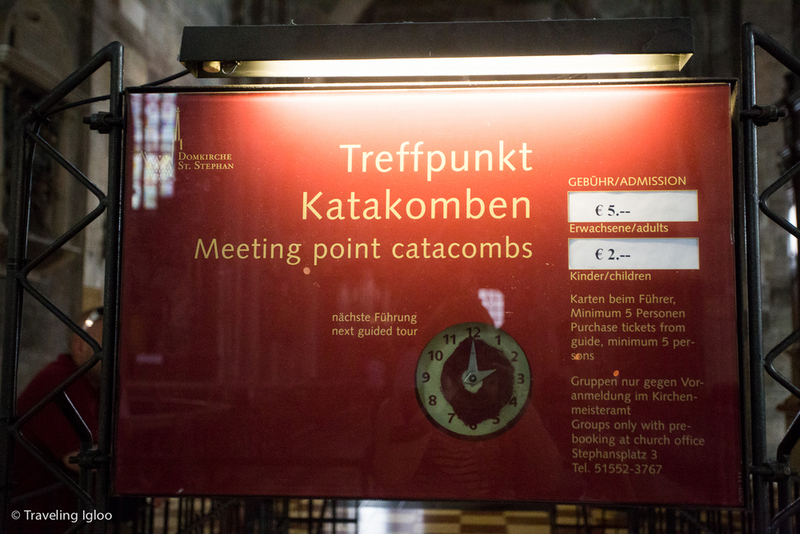 There is a meeting point inside, and you pay 5 Euro, but it's a cool experience and you get to see lots of bones if you're into that sort of thing. It's hard to miss the old town area, and you can spend a fair amount of time wandering around this area. 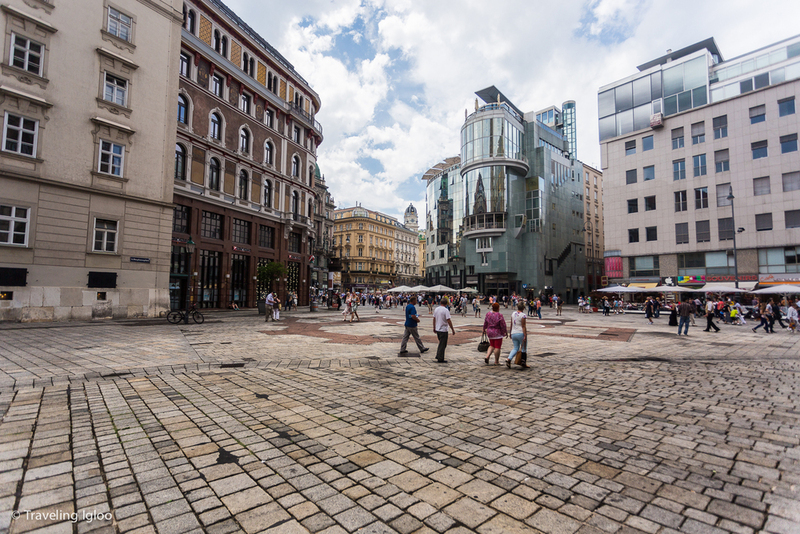 Try to take some of the side streets, see the Spanish Riding School, visit the marvelous library all while heading toward the famous Lindtmann cafe, and soak up the architecture and Viennese lifestyle. Just to name few things. So many Australian Pubs in Vienna! If you love opera, then Vienna should be at the top of your list of places to visit. The Viennese opera house is one of the most famous in the world. This opera is very active and has different performances throughout the year. When I toured the opera house they said that you could come every night, multiple days in a row, and a never hear the same opera twice. So theoretically you could visit Vienna for a week and hear a different opera each night. Tickets should be bought ahead of time, but if you forget to book ahead, then there is a standing area where you can go for viewing. Wait times can be long, upwards of an hour, but you get to have this once in a lifetime opportunity. If you like opera but don't want to spend a full night listening to it, then consider a tour of the opera house. It's a beautiful building that was nearly destroyed in World War II, and has since been rebuilt to the beautiful architecture you see today. There are many day tours that will take you to Bratislava if you're keen to see if Eurotrip depicted it correctly or add another country to your list. If we had another day we probably would have checked it out, because why not? Since we didn't, I dragged everyone into a nice long walk to get to the Danube because I have a constant need to feed my overactive wanderlust. Along the Danube were many restaurants, bars, and clubs that appeared to run pretty far along the river. We stopped for a drink, but by that point we had walked so much that we were exhausted and it was late in the day. However, we still were able to see much more of the city, and even see a pool floating on the Danube! 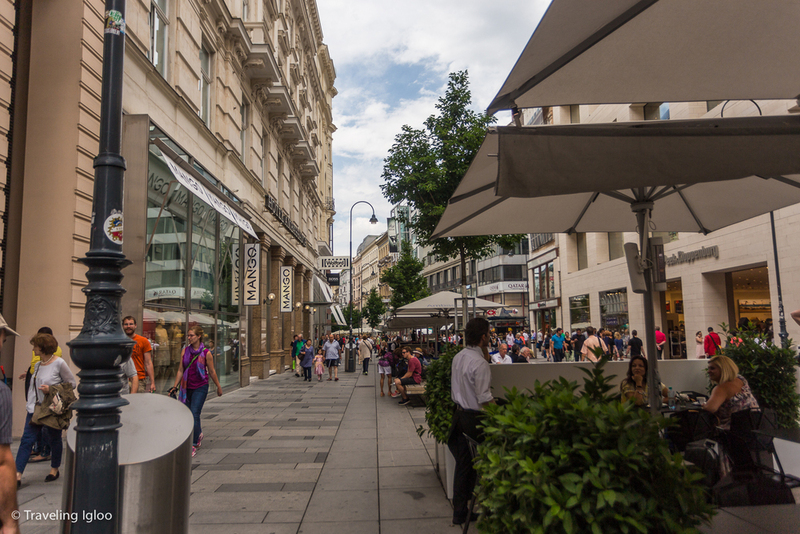 Vienna is also an international city, and good food at reasonable prices can be found nearly everywhere. When in Vienna, you must visit some of the cafes and sip on famous Viennese coffee, have some eis (ice cream) or experience the afternoon kaffee und kuchen (coffee and cake), a popular afternoon ritual in Germany and Austria. Head to a show, see the ballet, or head to the opera or other music venue for a great night out. There are many open air outdoor venues with live music during the warmer months. I would suggest visiting the tourist information office and heading online to see what's going on when you visit. I'm not even going to attempt to compile a list because it would be too exhaustive.